The most famous sandwich in New England is a lobster roll. What can you say about a lobster roll? After all, it is just a sandwich served on what most people would call a hotdog or frankfurter bun. But what a sandwich it is! It consists of succulent, sweet lobster meat barely dressed with mayonnaise and served on a buttered and toasted “New England style” hotdog roll. It is Yankee simplicity at its’ best. Oh my, is it good…wicked good as a New Englander would say. While spending my summers in Maine, I often write about my travels around the state mentioning beautiful places to explore and good food to seek out when you visit. It might be a well known white tablecloth restaurant or a seafood “shack” by the water. When I mention eating lobster, the comments from readers is always about wanting to try a lobster roll when they visit Maine. Originally the sandwich was found in areas that had an abundance of lobsters living off their local waters…along the eastern coast of Canada, New England and as far south as Long Island, New York. This sandwich of humble origins can now be found in many places throughout our country and has even made its’ way to well known restaurants in Paris. There is no real recipe for a lobster roll but purists will say that it is chunks of fresh knuckle, claw and tail meat from a lobster mixed with just enough mayonnaise to hold it together. It is piled to overflowing in a “New England style” split top white roll which has been lightly buttered on the outside and grilled to a golden brown color. That is it. Of course, you will find the sandwich being made with celery, onion, lettuce, avocado, and different herbs and seasonings. It might be served on a croissant, a baguette, a whole wheat roll or a hamburger bun. I’m sure most variations are very good but if you have one of them just don’t let the lobster roll purists in New England know that you liked it. If your diet limits the eating of gluten or carbs, all hope is not lost. You might consider having lobster salad stuffed into a vine ripe tomato served on a bed of lightly dressed greens. Here you can have a little more discretion with what you mix with the lobster. I would still suggest just enough mayonnaise to hold the lobster together but not mask its’ sweet flavor. I think a touch of lemon juice, a small amount of chopped fresh tarragon, salt and pepper compliment the lobster well. With the price of lobster at $3.99 a pound (less the chopped beef), this has been an indulgent summer for the many people living in Maine and throughout New England. There is no guilt in eating lobster often, whether it is boiled or steamed with drawn butter, stirred into risotto, served with pasta, eaten as a salad or even the most famous sandwich in New England, the lobster roll. I do hope that you get a chance to visit New England sometime. If you do, you might want to go on a quest to find your favorite lobster roll. It is out there just waiting for you to discover it. This entry was posted in Uncategorized and tagged food, lobster roll, Maine, New England, Recipes, seafood. Bookmark the permalink. Yes, I DO want a lobster roll. Right now! Love ’em! Thank you for reminding me. Hi Kay, Happy to remind you of about having a lobster roll. It is funny…I was just on your blog at the same time. Have a nice day. Hi Stephanie, Thank you for stopping by and your nice comment. The lobster was delicious. Down here in Ct. The best lobster rolls are found along the Ct. Shore. My favorite is buttered lobster in a toasted roll, no mayo. Just plain good! Thanks for a great post. Hi Carolyn, Yes…restaurants in Connecticut tend to make a lobster roll hot with butter. It is delicious as well. Thank you for stopping by and your nice compliment. Hi Uru, Thank you for your nice comment. It really is a scrumptious sandwich. Have you ever been to St. Anndrews, NB, by any chance? A place called Connoly’s Lobster used to do the best lobster rolls everywhere… I haven’t been there in over 20 years so I would be surprised if the quality lasted … they were humongous! Hi John, I’ve never been to St. Andrews. I bet if you went back the lobster rolls would still be good. Most places tend to pile them high with lobster meat. Lobster roll is one of my favorite sandwich, but I love your take on the classic, very creative. I am drooling looking at your heirloom tomato stuffed with succulent lobster on a bed of greens. Hi Norma, Thank you for your nice compliment. I have to agree with you about lobster rolls. I still remember when and where I had my first one…so good. I only have a few tomatoes left in the garden…I will definitely miss them. Just cooked down a huge pot into a thick tomato concentrate for the freezer. A couple years ago my friend who is from Maine flew in some lobsters and made lobster rolls for a group of us who have always lived land locked lobster roll-less. I was amazed at how good this was in all it’s simplicity. Hi Lea Ann, Sounds like it must have been fun to have a lobster roll party with friends. I think the simplicity of the sandwich lets the lobster shine through. Thank you for your comment. Hi Mad Dog, They are terrific. I’d like to see you eat a dozen. LOL. Hi Frugal, Yes…less than beef, even less than bologna. Everyone has been going crazy buying lobsters. It is an indulgent but totally simple sandwich. Thank you for your comment. That really is crazy! Simple is best when using ingredients like lobster! No problem of course, Karen! I would never turn down any variation, but the purist version was always my favorite. Now I developed an allergy and I miss those rolls! Both of your versions look fantastic. Hi Carol, It is terrible to have an allergy to lobster. The nice thing is that you got to enjoy it at one time. Thank you for your compliment. I love lobster but it’s a very indulgent expensive treat in UK … your New England purist simplicity just had to be the best way to serve this. Yum! Hi Kay, It is a shame that I can’t send all my friends lobster so that everyone could enjoy this simple and delicious sandwich. Thank you for your comment. 3.99 would be sweet here…love those lobster rolls and I adore sweet potato chips. Hi Donna, I have read that Maine is shipping lots of lobster…perhaps your fish market will have a sell. The sweet potato chips were perfect with the lobster roll. Thank you for your comment. Delicious! When we were in New England in May, lobster rolls were on the menu at Panera–$16!! Are your leaves changing into their autumn attire? Hi Bonnie, I don’t think the chain restaurants ever deviate in their prices no matter their cost. Yes, the leaves are just starting to change color but the peak won’t be until around the 10th of October. There are frost advisories out for tonight. Thank you for your compliment. I have never had the pleasure of a lobster roll, as I have not been to Maine. 😦 I must say though, the lobster salad would be more likely something I would order — it looks so luscious! Hi Judy, Thank you for your compliment. The lobster salad was delicious…especially with the heirloom tomato. A few simple ingredients made a wonderful meal. Hi Larry, I think your theory is right…it sounds like you had a purist lobster roll. I truly think you would have loved the ones in the photo. Wish I could send you one. Yankee simplicity at its best–what a perfect summation of this New England Classic. Oh, how I wish I could bite into one of those right now! Hi Victoria, I think this post is going to have everyone craving a lobster roll. It really is a simple sandwich but the flavor is oh so good. Thank you for your comment. Hi Mary, With the price of lobster being so low right now, it really is one of the best things to be eating. I haven’t been to Free Range Fish, I’ll have to check it out. I think I see lobster in your immediate future. Enjoy! Hi Heather, Thank you for your compliment. It sounds like you are trying to live a healthier life style…good for you. I love vegetables but I just couldn’t live such a restrictive lifestyle. I guess that means no more fish tacos for you. It almost makes me cry to think about it. Seriously. We may have to make a monthly exception to the rule. And fish is the only meat I would consider eating now. Stay away from documentaries if you enjoy your lifestyle! It is a good thing I write about travel and gardening besides food or you would stop reading me. How could I live without luscious ripe cheese, crisp bacon, a juicy hamburger or succulent ribs on a summer day. It is a good thing that I am immune to documentaries. LOL. This looks so good- perfectly simple. Somme things need to be tasted just as they are. Thank you Siobhan, for your nice compliment. Simplicity works so well with so many ingredients…lets the flavors shine through. Oh how lucky you New Englanders are Karen! We have our brand of luck out west too but it doesn’t include lobster (and certainly not at $3.99/lb!) Pure indulgent luxury for us but One Day, One Day! Hi Spree, Thank you for your comment. New Englanders really are lucky in so many ways, especially when it comes to wonderful seafood. This winter when I post a photo of mountains of stacked snow from plowing, you might not think we are so lucky. LOL. Hi Richard, Oh yes…the never ending debate of who has the best lobster roll. I’ll leave that to others to decide because I naturally think mine is the best as I make it just the way I like it. LOL. Having grown up in Texas I know what you mean…summer really is fantastic in Maine. The countryside is beautiful, there is so much to do, the seafood is outstanding and the weather is usually much cooler than most parts of the country. There is just that one tiny thing about New England in the winter and that is too much snow and cold for lots of people. Actually you get used to that after awhile but we always look forward to spring. Hi Annie, Unfortunately it seems that New England is the only place that lobster is so cheap. Thank you for your comment. Would you believe we went all summer without doing lobster once? What was I thinking? Hi Marie, Go out and get some lobster fast…I’m sure the prices will be rising soon. I can’t believe that they stayed so low for the entire summer. Grilled lobster is delicious. I used to have it that way when we lived in Florida…grilled Florida lobster tails with key lime butter. Yum. I do LOVE lobster (or fish of most any kind for that matter) but I’ve never had a lobster roll… it makes me want to come to Maine looking at your pictures, commentary and recipe 🙂 Thanks for sharing. Hi Swanlzs, I’m glad that you enjoyed the post. I think that you would enjoy visiting Maine one summer…it is lovely. If you love lobster then you would enjoy a lobster roll. Just think of it as eating lobster without all the mess. Hi Boleyn, I think you are right…I couldn’t wait to try a lobster roll the first time I came to New England. That and wild Maine blueberry pie. Thank you for your comment. I have never had a lobster roll and clearly my life has been lacking. I’d like to remedy that with a trip out east for an authentic version! Hi Marlene, Your life might not be lacking but you might be happier after eating a lobster roll. Sitting at a picnic table at a “seafood shack” overlooking the water somewhere in New England is really quite lovely…especially with a cup of clam chowder and a lobster roll. Hi Roger, Wish I could have you at our table in Maine for a lobster dinner. I find that when I travel…many restaurants overcook seafood. When lobster is overcooked it looses its sweet, succulent flavor and turns tough. Your lobster might not have been memorable while you were in Collioure but I bet the beautiful blue water was. Thank you for your comment. Karen, your teaser – if I was able to buy lobster for that price … I would be living on lobster. Like the lobster roll .. and the salad, but one fresh lobster would cost me about $20 each. Too expensive for a roll, but I would love one … now. Hi Viveka, I don’t mean to be a tease. I wish everyone could be enjoying lobster for the prices we are paying now. The price rises in the winter but understandably so. I wouldn’t want to be out pulling traps then. Only joking, Karen …. I love lobster and if I where you I would eat it in all forms and shapes so long the price is right and don’t feel gulity at all. smile … still you’re teasing us! Don’t worry, I knew you were joking…you have a wonderful sense of humor that I love. I agree…I enjoy lobster when the price is good but will choose something else when the price is high. Hi Stewart, Please don’t be jealous…you have Dungeness crab after all. You just didn’t travel far enough north to get lobster at a good price. Karen, stop doing this to me. I am suffering serious hunger pangs just looking at the first photo. Awesome looking sandwich. Sorry Conor, to have made you so hungry. I’m glad you liked the photo of the lobster roll. Now you know why I called it the most famous sandwich in New England…everyone wants one. Thanks for your compliment. Oh yumm. I loved those lobster rolls when I lived in RI. You rarely seem them outside New England or the Pacific NW…. Hi GG, Thank you for your compliment. I think you are right about not finding them too often outside of New England. Maybe that is a good thing…when you get one here you know it is very fresh. I’m sure you do miss them as they are so good. Karen, a lobster roll sounds fabulous! And you wrote about it so wonderfully that I’m longing for one, right now. Lobster is so expensive here in the Great Lakes. The last good inexpensive lobster I tasted was in Nicaragua last winter. It was such a treat. Sounds like a trip your way should be in order! Thank you Kathy, for your lovely compliment. Lobster plus beautiful places to visit…yes, I do think you would enjoy a summer visit to Maine sometime. I guess as far south here on Long Island , the price goes North, lol. Haven’t seen that price in years! Love a lobstah roll! Hi Kathleen, Thank you for stopping by to visit and your comment. The only time I was on Long Island, I thought most prices were a little high. I guess the only answer is to make your way to New England for a visit sometime. I get as far as Ct and RI, but would love a trip to Maine. We rarely travel due to dh’s disability. I tried to email you back from your comment. You have a no reply blogger addy. I wondered what type of apples you grow in NH? Sorry you couldn’t find my email address…it is listed on my about page. As for what type of apples we have in our orchard at our home in New Hampshire, there are a hundred different varieties…mostly heirloom. Hi Charlie, I guess a lobster roll is more famous than I thought if the reputation has reached the land of Oz. The prices on lobster stayed low all summer long and made for a lot of happy eaters. Thank you for your comment. Well they sure don’t make lobster rolls with huge chunks of tail and claw meat here; that insipid bun would be totally forgivable if our lobster rolls looked as good as your’s! Commenting from Budapest and the Internet is quite shoddy (hopefully third time lucky). Hi Eva, I was surprised and delighted to see your comment. I appreciate you taking the time out of your holiday to comment about the lobster roll. I fixed the typos and deleted your other comments as you wished. I try to correct any typos that I see whenever anyone comments and hope they would do the same for me. Enjoy your trip…I know it will be wonderful. Hi Kristy, I hoped you would enjoy this post. I’m glad that I can bring back memories of your family trip to Maine. One word- YUM! My mouth waters just looking at the pictures and of your descriptions! Hi Bella, Thank you for your nice compliment. I do have to admit that both lobster dishes were delicious. I love sandwiches made with seafood. Especially prawns (shrimp), crab and crayfish/lobster. It is such an indulgent but lovely treat. Hi Gary, I have to agree with you…a sandwich made with fresh seafood is the absolute best. Thank you for your comment. Although any variation of lobster is just fine with me, when it comes to a lobster roll I have to say I’m a purist – biggest sin is putting celery in there. I guess our luck is running out in Mass – today we were up to $6.99/lb. But still, it’s cheaper than a lot of other things that I don’t like as much so I’m not complaining at all. Hi Diane, Thank you for your comment. Even though I love all vegetables, I have to say that about the only thing I put celery in is stuffing for a turkey. It will be interesting to see what the price of lobster is when we go back home to New Hampshire after we close our cottage in Maine. I was there a little over a week ago and Market Basket was still selling lobster for $3.99. Even at $6.99, lobster is less than steak. After hearing what lobster costs in other parts of the world, we are very lucky to have lobster at such a wonderful price in New England. Sounds delicious! I love the simplicity so that you can really taste the lovely sweetness of the lobster. Hi Carolyn, Thank you for your comment. Simply dressed lets the flavor of the lobster shine through. Delicious! I’d love a sandwich right now! Thank you Chunklet, for your nice compliment. Wish I could send a lobster roll your way. Hi Karista, I know the feeling…I had lobster three days in a row on our recent trip to Bar Harbor. When you have the opportunity to eat fresh lobster, you need to take advantage of the situation. Thank you for your comment. Hi Marina, Many a person that visits New England goes on the quest for the best lobster roll. Better than buying souvenirs. LOL. Thank you for your comment. I still can’t believe that lobster is 3.99 a pound! It’s at least 15 a pound here! I would love a lobster roll! It looks delicious and reminds me of the oyster po boys I use to eat in Louisiana! Luscious seafood in a sandwich! Hi MJ, Thank you for your comment. Fresh seafood served as a sandwich…I love them all. As the weather turns cold, the price of lobster in New England increases but always is reasonable. Sadly, can’t say I will be enjoying a lobster sandwich any time soon as lobster costs an arm, leg, eye tooth and a second bond on the house here but my oh my what a decadent roll that is Karen. Hi Mandy, I do wish lobster was the same price all over the world so that everyone could experience this tasty sandwich. Thank you for your compliment. Hi Tanya, Thank you for your compliment. Both of these dishes were delicious. Hi Tania, I do hope you get a chance to visit Maine one day and go on a lobster roll quest. It is a delicious way to experience New England. Hi Linda, I think I have to agree with you…New Englanders like their lobster rolls simple and their clam chowder white. Having so many heirloom tomatoes ripe on the vine, the salad was pretty much a given. Thank you for stopping by and your nice compliment. YUmm Yumm Yumm! I have to admit, anything with lobster is addictive. We have found so many off the beaten path places in Maine that serve the most scrumptious food…we really need to take a drive back up there…a six year absence is far too long!!! Hi David, I have to agree with you…lobster is addictive. Maine does have such fresh seafood and when traveling the back roads it is nice to find a good restaurant. Next summer, you should try heading this way again. Six years really is a long time to be away. Thank you for your comment. Oh boy. Oh boy. Oh boy does that look amazing! If lobster were that price here, I’d eat it every day. Thank you Greg, for your nice compliment. Believe me, people here in Maine may not be eating it everyday but we certainly are taking advantage of the good price when we can. Years ago I lived in Connecticut (Norwalk), and that’s lobster roll country (great fried clams, too). Such a delicious sandwich! I haven’t had one of these in ages – you’re tempting me to go get some lobster just to make one! I had actually totally forgotten about these – thanks for the reminder! Hi John, I’m glad I brought back memories of lobster rolls from when you lived in Connecticut…they are delicious. New England really does have great seafood. Fried clams are one of my husband’s favorite. Thank you for your comment. Hi Jerry, Thank you for your nice compliment. I’m glad you like the looks of my lobster roll. 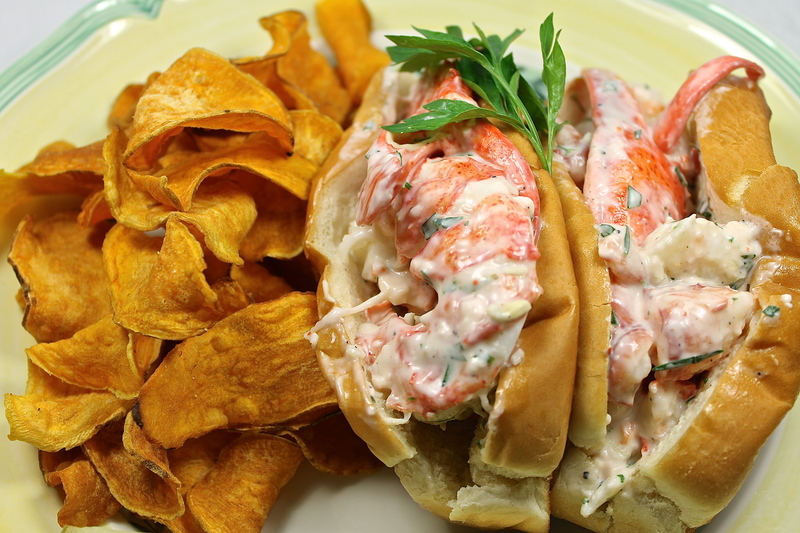 If you are going to make a lobster roll, you have to do it right…no skimping on the lobster. Oh, to live where lobster is cheap! That sandwich looks absolutely divine, Karen! Thank you Celia, for your nice compliment. The price of lobster in New England is usually good but this year it was exceptionally good. Wish I could share my good fortune with you. I’ll be there shortly! This sounds wonderful. I can’t imagine living in a place where lobster is an every day event. It’s such a luxury treat here! Hi Chris, I’ll keep a place at the table for you. It appears from the comments from readers from around the world that living in New England definitely has its advantage…at least where seafood is concerned. Thank you for your nice compliment. You are making my mouth water – YUMMERS! Thank you Renee, for your compliment. I’m glad you enjoyed the post. Hi Betsy, I’m glad you like the looks of the lobster roll. It really was Mmmmmmm sandwich. Ahhhhh the “lobsta roll” as would say here in Massachusetts! A personal favorite. I have to say I enjoy a bit of a gussied up one with a high quality tasty mayo and little bit of chopped celery – that is it and bring on the knuckle meat ’cause I think that is the best tasting meat! Perhaps you have run into this one before… fried lobster – Woodmans in Essex Ma does it and it is YUMMY! I think maybe Browns in Seabrook might too! try one if you get a chance. Hi Carol, I knew you would appreciate my honoring New England’s famous “lobsta roll”. My husband agrees with you about the knuckle meat. I always get his claws and he gets the knuckle meat. Fried lobster…yes, it is the best. When we are home in New Hampshire and want to have lobster, we go to Newick’s in Newington, N.H. I always order a cup of their clam chowder and their fried lobster tail. Yum! Hi Bam, I totally agree that lobster is not only delicious but decadently good. I really did love the lobster stuffed heirloom tomato salad. Wonderful but still a healthy meal. Thank you for your compliment. Hi Celi, Thank you for your comment. I have been having a problem with my reader not showing current posts as well. I have also had a problem with my comments going into the spam file when I leave a comment on other blogger’s posts. I appreciate the note from you and others. I am sending out a similar one. I have contacted WP support…hopefully the problems will be worked out. Hi Raymund, I do hope that you will be able to track down a lobster. Thank you for your comment. No wonder it’s the MOST famous sandwich! It looks heavenly! Believe me Angie, this is a sandwich that is as good as it looks. Thank you for your compliment. I doooo love lobster. We have our own lobster roll classics here on Long Island, which is part New England and part Middle Atlantic (yes…it completely messes with planting zones….). This looks delishus! Hi Natalia, Thank you for your compliment. Your lobster roll sounds interesting. Yes…it definitely mixes planting zones. LOL. I still remember the lobster roll I had when I visited Maine years ago. What a treat! No lobster here on the west coast (over $30 a pound in the fish market if they do carry it). Dungeness crab is caught right here and that’s $30 a pound as well. It’s so good it’s worth it. Hi Cathy, I am just like you…I still remember when and where I had my first lobster roll. I can understand lobster costing more on the west coast because of shipping by air but $30.00 seems expensive. And $30.00 a pound for your local Dungeness crab seems high as well. I have to agree that when something is really good I am willing to pay more for it. I just don’t have it as often. Thank you for your comment. I love lobster, and I’m envious of the quality and the price! I’ve never had a lobster roll, but why not? It would make a wonderful sandwich 🙂 Sounds so good, Karen. Thank you! Thank you Debra, for your nice compliment. The price of lobster over the summer was great. If you ever get a chance to have a lobster roll, I think you will really enjoy it. Thank you Kay, for your lovely compliment. I wish you could reach through the screen and take one of the lobster rolls. They were as good as they look. This is so much fun seeing a lobster roll with a side of chips! It’s something to look forward to and very satisfying. Great pictures! Thank you Meg, for your nice compliment. A lobster roll with chips and a pickle is usually the way they are served. I definitely wanted to be traditional with this meal. Of course other sides like corn on the cob or fries can also accompany this sandwich. I wouldn’t imagine anything other than lobster to be New England’s most famous sandwich filling! Mmm, they really look irresistible! Thank you Katerina, for your nice compliment. You are right…when people think about New England, they usually think of lighthouses and lobsters. A lobster roll is so simple but totally delicious. I sure wish lobster was that inexpensive here! The lowest I’ve seen it is about $10 a pound for a small live lobster, which still isn’t bad. Those beautiful chunks of lobster meat look so delicious! Hi Susan, Lobster was such a bargain this summer. It was hard not to indulge in lobster often. From everyones comments about what lobster costs where they are, it sounds like $10.00 a pound isn’t bad. Thank you for your nice compliment. That is certainly cheap! It costs a fortune here. I love how you stuffed the bread in the first photo with what looks like the whole lobster. In fact, why break it up? There’s no need. Hi Suzanne, Thank you for your compliment. When you buy a lobster roll in a “seafood shack” the meat is cut into chunks. I do the same but like to top each roll with a claw or a nice piece of the tail meat to make the sandwich special. I find it hard to chop up those luscious pieces. You’re doing good with lobster, girlfriend. Considering the price, there’s no reason not to eat it, lots of it! That reminds me I need to tell my lobster guy I’ll pick some up off the boat tomorrow when he comes in. Lobster roll for dinner sounds good. Thank you Linda, for your nice compliment. I totally agree…eat as much lobster as you can while the price is low. Enjoy your lobster! Incredible! At $3.99 per pound I think we’d be feeding our seafood addiction quite well. To think a single lobster costs us approx $47 Aud here in Sydney. It’s shocking and both exciting to see such gorgeous specimens as these sandwiches and beautiful examples of ways to celebrate this prime ingredient at its peak season, thanks for sharing as always! Hi Alli, I know that $3.99 is a low price for lobster but $47.00 for a lobster is very high. Yes, they have to be shipped halfway across the world but more than 10 times the price is hard to understand. Wish I could send a lobster to each of my readers. I’m glad that you enjoyed the post…thank you for your compliment. My kinda food!! Totally dream food. Hi Misky, I have to agree with you…lobster is delicious. Thank you for your comment. I love lobster and I love mayo. Perfect. Hi Wendy, A crab roll sounds terrific with the fresh crab you have available. Thank you for your comment. Wow, lobster meat is so cheap there! Well at least compared to here. I love lobster rolls! The best one I’ve ever had is at the Crab Shack in Kennebunkport! Hi Ducky, I know lobster is cheap here…especially after everyone has been telling me how much it sells for where they live. I haven’t eaten at the Crab Shack, I’ll have to try it. When we are in Kennebunkport, we eat at Mabel’s. It is very good. You are killing me with all this talk of lobster! Stop it already – just kidding. I”m just jealous! Hi Linda, I completely understand…wish I could share my lobster with you. I won’t mention lobster (if I can help it) until next summer. Well maybe that is a rash statement. I’ll warn you ahead of time if I am going to talk about lobster and you can avert your eyes. LOL. So jealous, lobster is so expensive in Ireland, about €20-30 per lobster from our local fisherman straight off the boat, so a lobster roll is a very very expensive sandwich but I absolutely love them. Hi Lacey, The price you pay for lobster straight from the boat is expensive. With the exchange rate for the dollar, they would be even more expensive for me…$32 to $45. That truly would be an expensive sandwich. I always pick a lobster roll when/if it’s at the good restaurant. I’ve never seen one that looks this good! Serving with sweet potato chips? This got to be one of the best meal. Hi Nami, There is not many times that a sandwich makes for a special dinner but this one was terrific. Thank you for your comment. Hi Ruth, Yes…join the crowd of very jealous readers who have to pay so much more for lobster. Stuffing the tomato with the lobster was very good. I would like all of my readers how are jealous of me now to come back in say February or March and let me know what they think about feet upon feet of snow on the ground. Let me know if you are still jealous of my living in New England. LOL. Never had one. Sounds, and looks, delicious. Hi Paula, I hope you get a chance to try one sometime. A lobster roll really is a delicious sandwich. Thanks for your comment. It’s on my bucket list to make it to the East. I will most certainly try one! I think you will love your visit to the east coast. I know you will enjoy having a lobster roll. A stunning, fabulously & truly appetizing lobster sandwich! Wow Sophie, what a compliment…thank you very much. I do have to say that the sandwich was as good as it looks. Hi John, I just had to make lobster rolls with the rest of the meat. They made for a simple but terrific dinner. Thank you for your compliment. Thank you Fuzzie, for your nice compliment. The lobster rolls were delicious. I do hope you get the opportunity to visit Maine and enjoy one of these sandwiches. Maine Lobster: Any way you’ll like it! I’m happy to know that you enjoyed this post and the lobster roll enough to reblog it. I love Lobster rolls. I went to Boston 3 weeks ago and that was the first thing I ordered! I like how you showed a stuffed tomato, as all that bread can be too many calories. Hi Chick, So nice to hear from you. I think a lobster roll is often the first thing that a visitor to New England orders when eating out. 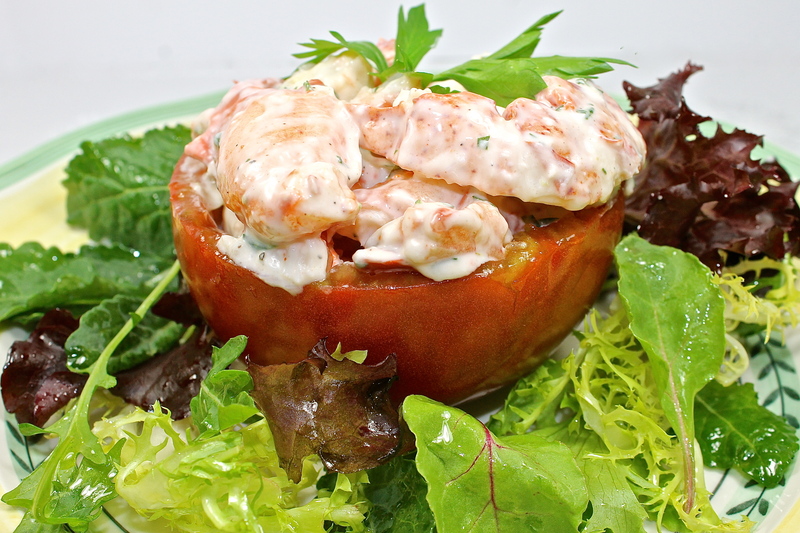 Having the lobster stuffed into a tomato not only saves calories but adds additional flavor when using a vine ripe tomato. Thank you for your comment. Karen, I definitely want a lobster roll. Looks sensational !! Hi Judy, Lobster rolls are so simple but one of the best sandwiches you can have. I’m glad you like the look of the sandwich. From all my adventures around New England, I think B&G Oysters has the best lobster roll!